APPARENTLY some money managers think gold looks under-valued right now, writes Adrian Ash at BullionVault. A record number in fact, according to CNBC. It says that 17% of the 231 professional investors replying to Bank of America-Merrill Lynch's monthly survey in July said the precious metal "may be too cheap". You might agree, down here at 12-month lows in Dollar terms amid the worsening trade war, Brexit meltdown, Trump-Russia intrigue and over-stretched equity markets. Priced against the US stock market, gold hasn't traded this cheap since the eve of the global financial crisis 11 summers ago. If only those fund managers could act on their insight! Like, y'know, buying gold at these knock-down levels. Or buying price exposure to the metal through ETF trust funds. Or even betting gold will go higher on the derivatives market. Sadly not. Quite the reverse in fact. Despite the value which "a record number" just told BAML they can see in gold, fund managers are actually selling gold-backed ETFs. 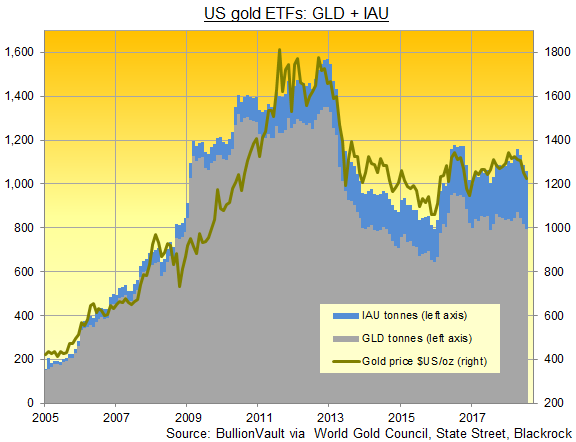 ...shrinking the GLD and IAU by nearly one-tenth since April. 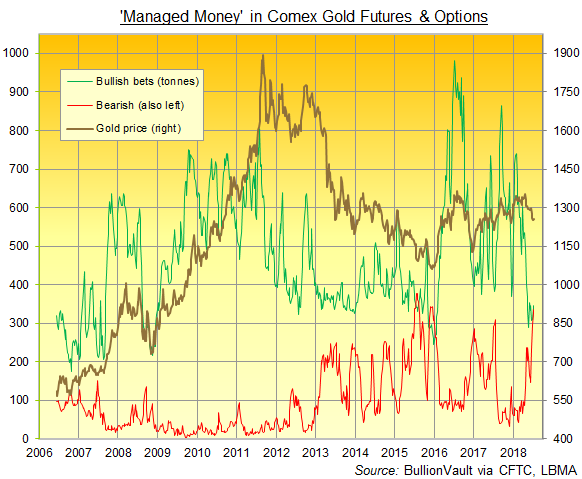 As for gold futures and options, money managers as a group are in fact betting against gold like almost never before. Data from US regulator the CFTC show that, among the 'Managed Money' category of Comex trader, bearish betting against gold has only been greater in 10 of the last 631 weeks. All 10 of those weeks came in 2015...back when gold prices finally found a floor after dropping for four years to reach the lowest Dollar price since the start of 2010. ...creating the only "net negative" position for money managers since current records began in 2006. Here in mid-2018, Comex betting will likely read net negative for this week when the CFTC reveals the data on Friday. So what to make of BAML's gold-friendly survey? Well perhaps, instead of ETFs or derivatives, the 'smart money' of professional investors really is buying gold. As in the metal itself, securely locked in a specialist vault with full insurance and zero default risk. We doubt it however. Because ETF flows remain a fair proxy for the flow of managed money into...or out of...physical accounts for gold bullion bars. And the price itself says that the big money is showing no interest in gold at the moment. A gap yawns, therefore, between intent and action among professional money managers. Armed with this knowledge, what else might we glean from BAML's new survey? Well, the latest report...polling money managers running two-thirds of a trillion bucks...says that 60% of professional investors now fear the "biggest risk" to asset prices is a trade war. Which tells you they read the same newspapers and sites as everyone else. Just 19% in contrast fear a "hawkish policy mistake" by the US or Eurozone central banks...and only 6% fear a Eurozone or emerging-market debt crisis. Take that as you will. Jerome Powell at the Fed sure sees no risk from hiking US rates either, and emerging markets led by China have never looked more solid. So you can cross them both off your list of worries. This same survey, by the way – back when it was run by just Merrill Lynch – found in August 2007 that money managers "were unwilling to turn fundamentally bearish on equities" even as the financial crisis hit global credit markets. Instead, with the stock market about to peak before more than halving on the Wilshire index of listed US corporations, a net 11% of professional investors said equities were undervalued...and only 7% thought a global recession looked likely in the following 12 months. The deepest recession since WWII didn't begin until 16 months after that August 2007 survey. By which point, the stock market had lost over two-fifths of its value. So as you can see, the 'smart money' really does know what it's doing. ...if only it could bring itself to do it. Private investors, on the other hand, show no such hesitance. Net of selling, users of BullionVault have raised their gold buying 5-fold over the last week compared to the previous 12-month daily average. Buying an average of 12 kilos per day, they have taken total client holdings here at the world No.1 online up to a fresh record above 38.8 tonnes, worth $1.6 billion (£1.2bn, €1.3bn, ¥175bn). Every gram is held at low cost in secure, specialist storage in the client's choice of London, New York, Singapore, Toronto or Zurich. And every client is free to buy or sell as they choose 24/7. Right now as a group, customers are choosing to buy. They're acting on the value which those professional investors claim they can see...but which they're failing to buy. Alongside our West European and North American client base, private investors in Japan are buying gold too reports Bloomberg. Again, they are defying the bearish action of professional money. To repeat: The 'smart money' is selling gold exposure as prices drop. Which is just how the herd must behave. ...and enabling early buyers to take profits just when the herd's frenzy to get in hits its peak. Nothing is guaranteed of course. And today's bargain hunters may perhaps be looking for a quick win. But looking at 5-year periods since 1968, our research finds that gold priced in Sterling has risen 96% of the time when the UK stock market has traded lower from a half-decade before. For US investors, gold has risen 98% of the time that the S&P has fallen over a 5-year period. Patience is more likely, in short, to reward investors buying gold on this summer's drop. Failing to act certainly won't.